Perodua is a one of the Malaysian branded automobile manufacturers produce a sedan and hatch back car at the 1000 cc category. 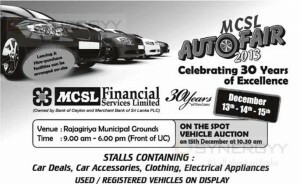 As Sri Lankan vehicle Import taxes are less for 1000 cc category compare to high power vehicles; these automobiles are easy reach to 1000cc markets and captured a subsequent market share in Sri Lanka. 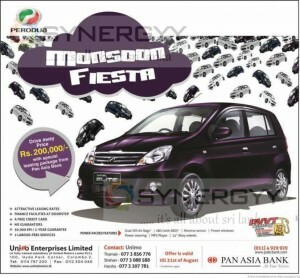 Perodua Bezza is known as 22nd anniversary automobile of Perodua and offer a sedan type of car at 1000cc. this is the only sedan type of car available in 1000cc category in Sri Lanka. Unimo Enterprises Limited is an sole agent for the Perodua automobile in Sri Lanka announces their all inclusive price for Perodua Axia auto-transmission for Rs. 3,195,000/-. 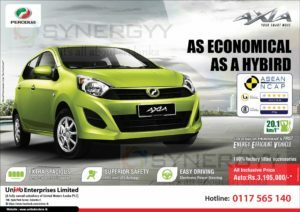 After the successful launch of Perodua Elite, Unimo Enterprise Limited launches the Perodua Axia to Srilankan automobile industry. 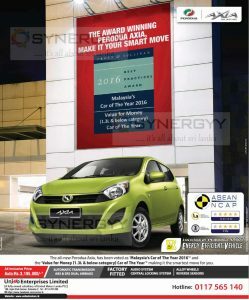 Perodua Axia has been voted as ‘Malaysia’s Car of The Year 2016’* and the ‘Value for Money (1.3L & below category) Car of The Year’* making it the smartest move for you. All New Perodua Axia comes with automatic Transmission, ABS & SRS dual airbags, Audio system, Central Locking System, Alloy Wheels, Reveres Sensors and many more features. 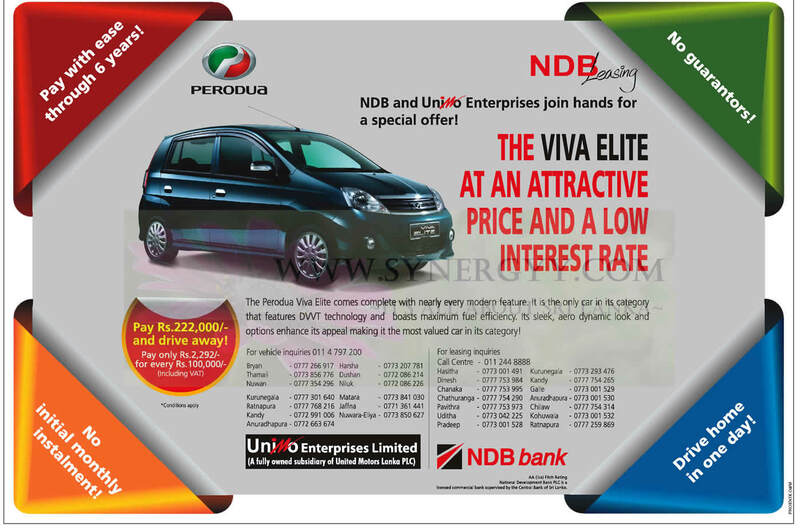 Unimo Enterprise Limited an importer of the Malaysian manufactured Perodua Cars in Sri Lanka said that the Unimo Enterprise Limited stop importing the Perodua VIVA Elite to Sri Lanka and there won’t be any new Prices for the Perodua Viva Elite with reduction of tax stated in budget. But instead of Perodua Viva Elite Unimo Enterprise limited going to import brand New Perodua Axia car to Sri Lanka. the official confirm there is no pricing has done yet but the car is expected to be Rs. 2.5 Million, where Perodua VIVA Elite was Rs. 2.235 Million before tax reduction. 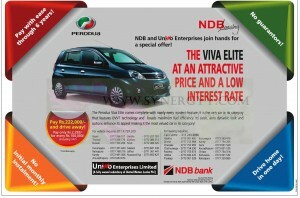 The NDB Bank announces a special leasing Option for the Perodua Viva Elite for Rs. 2,115.00 each Rs. 100,000.00. 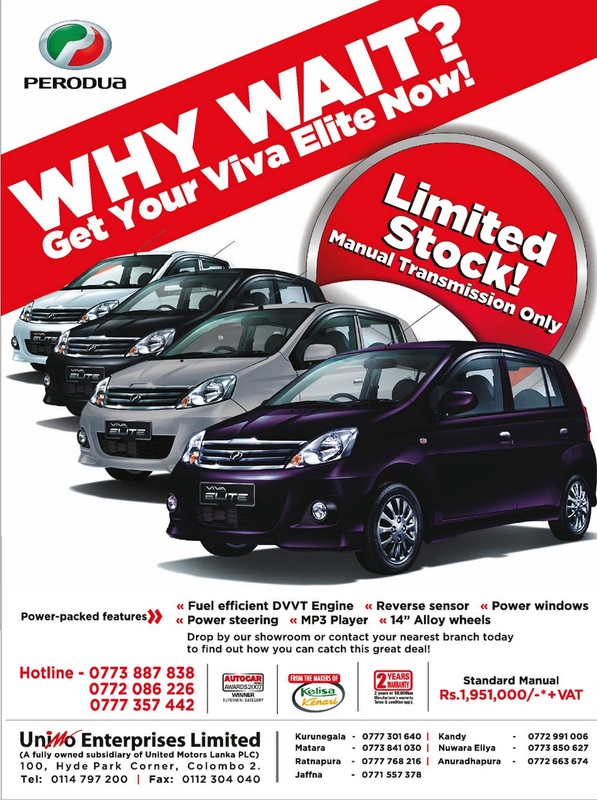 Drive your Perodua Viva Elite for Rs. 250,000.00 now and pay balance on Installment basis with NDB Leasing from NDB Bank. NDB Leasing don’t required any of upfront rentals and guarantors. And Pay with ease through 6 years and Drive home in one day. 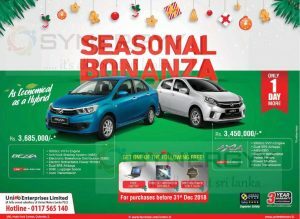 The Pan Asia Bank announces special Leasing Option for the Perodua Elite car for the down payment of Rs. 200,000.00 with special package. The special offer is valid till 31st of August 2013. 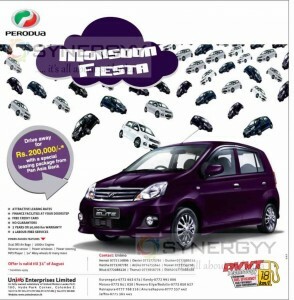 Drive your very own Perodua Elite car for Rs. 200,000 with a special leasing with Pan Asian Bank. The Unimo Enterprises Limited announces the New Price of Perodua Viva Elite as Rs. 2,235,000.00 upwards. Drop by Unimo showroom or contact your nearest branch today to find out how you can catch this great deal! 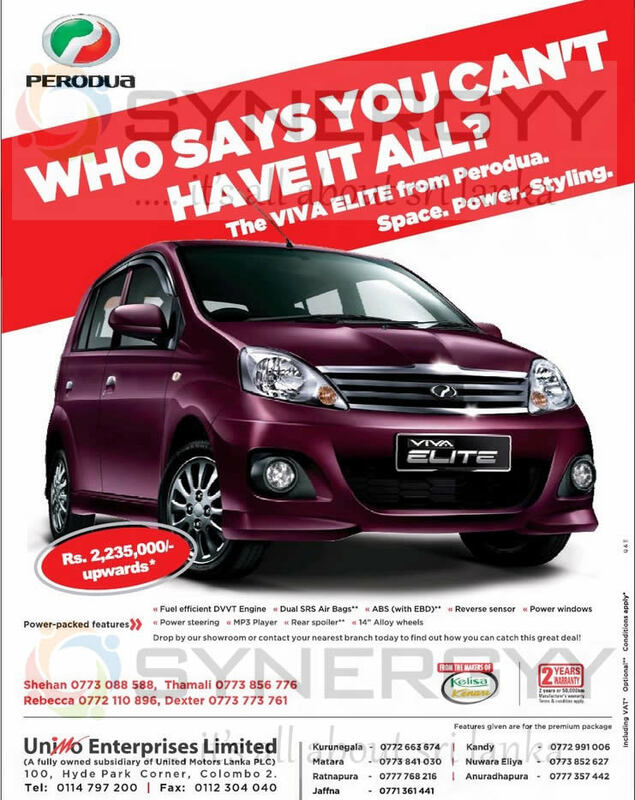 The Perodua Viva Elite showroom now at Kurunegala, Matara, Ratnapura, Jaffna, Kandy, Nuwara Eliya and Anuradhapura. The Perodua Viva Elite comes complete with nearly every modern feature. 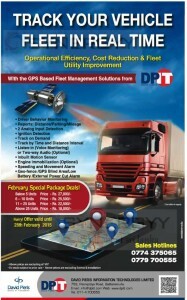 It is the only car in its category that features DWT technology and boasts maximum fuel efficiency. Its sleek, aero dynamic look and options enhance its appeal making it the most valued car in its category! 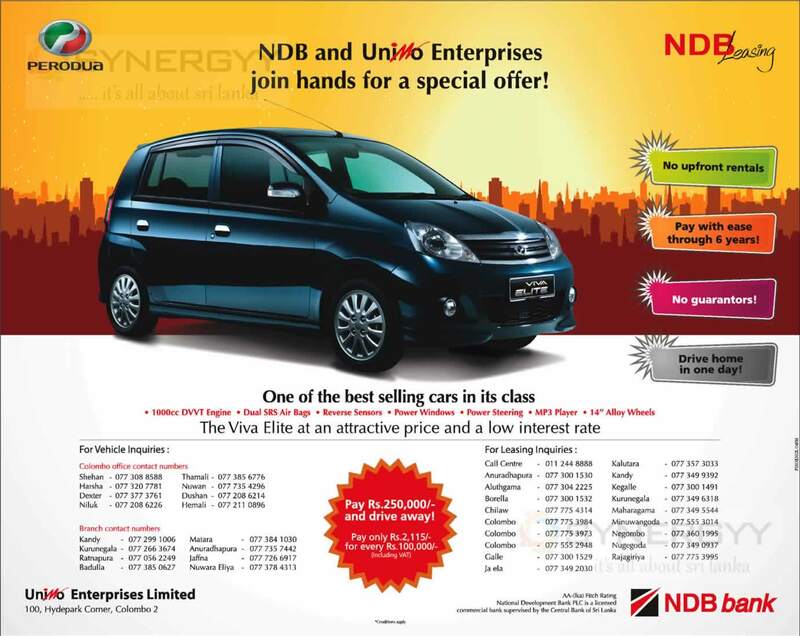 NDB leasing and Unimo offers the Perodua Elite with leasing features with down payment of Rs. 222,000.00 and balance on monthly installment. 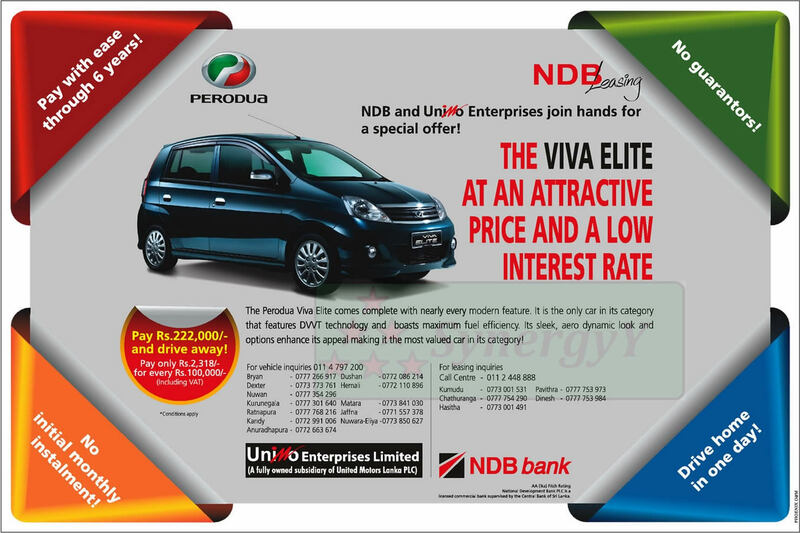 The NDB Banks offers attractive leasing options for the Perodua Viva Elite; the Perodua Viva Elite comes complete with nearly every modern feature. It’s the only car in its category that features DVVT technology and boast maximum fuel efficiency. Its sleek, aero dynamic look and option enhance its appeal making it the most valued car in its category. Pay Rs. 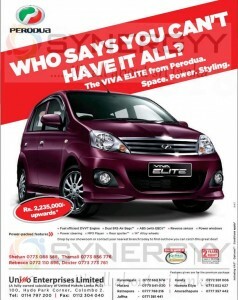 222,000.00 on down payment and drive your Perodua Viva Elite car to home. 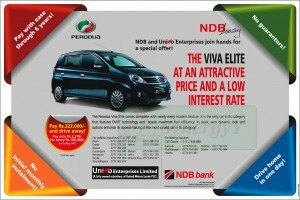 The Unimo Enterprises Limited an authorised agents for the Perodua VIVA ELITE in Srilanka. 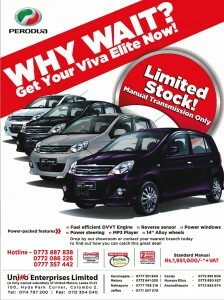 The Unimo made a special offer for Perodua VIVA ELITE Standard Manual for Rs. 1,951,000 + Vat. The Perodua VIVA ELITE is an Small Car with all modern features to satisfy you and your requirement with best fuel efficient.